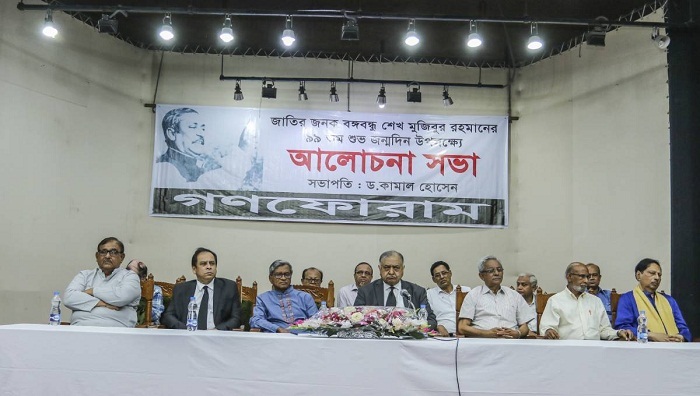 Gano Forum President Dr Kamal Hossain on Monday called upon people to put up a strong resistance against those creating obstacles towards implementing Bangabandhu’s dreams of establishing democracy and ensuring free and fair elections in the country. “Bangabandhu’s dreams were written in the constitution. His first dream was to establish democracy. He also gave the highest importance to ensuring free and fair elections,” he said. Gano Forum arranged the discussion at the Supreme Court Bar Association auditorium, marking the 99th birth anniversary of Father of the Nation Bangabandhu Sheikh Mujibur Rahman.